A pseudoconical projection that is neither conformal nor equal area. Often called the American Polyconic in Europe. 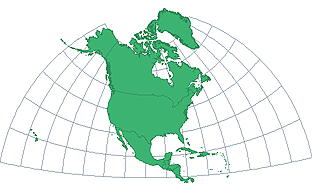 The central meridian and Equator are straight lines. All other meridians are complex curves. True to scale along the central meridian. Each parallel is true to scale. Free of distortion along the central meridian and near the central meridian distortion is very small. Used almost exclusively in slightly modified form for large-scale mapping in the United States until the 1950's. Normally used only for a single hemisphere. Apparently originated about 1820 by Ferdinand Rudolph Hassler (1770 - 1843). Hassler was born in Switzerland in 1770, arrived in the US in 1805, taught mathematics at West Point and became the first Superintendent of the U.S. Coast Survey, later heading the Bureau of Weights and Measures. Hassler died in Philadelphia in 1843 as result of exposure after a fall while trying to save his instruments in a severe wind and hail storm.